Pope Pelagius I was pope from 556 to March 4, 561. His papacy was clouded by the suspicion among the Roman clergy and faith community that he was an agent of imperial policy during the aftermath of the Monophysite conflict which had divided the eastern and western churches. Pelagius I came from a wealthy Roman noble family and was known to be a confidant of Emperor Justinian I during the time when Pope Silverius was alleged to have committed treason against the empire on behalf of the Goths. Later, when his predecessor, Pope Vigilius, was taken to Constantinople on the orders of the emperor, Pelagius stayed in Rome as the pope's representative and, as his deacon, became the de facto bishop of Rome. When Totila, king of the Goths, blockaded the city, Pelagius used his own wealth for the benefit of the famine-stricken people. He later influenced Totila to spare the lives of the people when he captured Rome in December, 546. Pelagius I openly condemned Pope Vigilius for allowing himself to be pressured to accept Emperor Justinian I’s religious policy, which was perceived in Rome as encouraging Monophysitism. Vigilius retaliated by excommunicating him. Later, however, Pelagius, too, accepted Justinian's policy under duress, just as Vigilius had, by endorsing the Second Council of Constantinople. 2.1 Independent pope or agent of Constantinople? After Vigilius' death, Pelagius was elected pope as Justinian's candidate amid strong opposition within the Roman church, which resented imperial interference, doubted the validity of the Second Council of Constantinople, and even suspected Pelagius in Vigilius' death at sea. 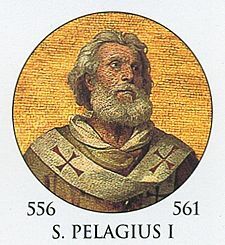 Pelagius' compromise with imperial policy seriously damaged the papacy's reputation in northern Italy, Gaul, and elsewhere in Western Europe, resulting in a schism over what is known as the Three Chapters controversy, which would not be resolved for several decades after his death. Pelagius I was born to a Roman noble family; his father, John, seems to have been vicar of one of the two civil "dioceses," or districts, into which Italy was then divided. He first appears in the historical record at Constantinople in the company of Agapitus I, who, just before his death in that city (536), appointed Pelagius to act of nuncio of the Roman church in the eastern capital. Allegedly through the intrigues of the Empress Theodora, ever portrayed in Catholic sources as scheming for the advancement of the Monophysite "heresy," Agapitus' successor, Pope Silverius, was deposed and banished from Italy by the Byzantine general Belisarius on grounds of treason in support of the Ostrogoths' siege of Rome. 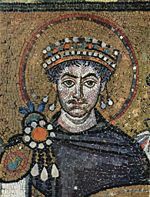 Emperor Justinian I, hearing evidence that the charges against Silverius had been trumped up, issued orders that Silverius should be recalled to Rome, investigated, and reinstated if proved innocent. The historian Liberatus reports that Pelagius was prevailed upon by the empress to travel to Rome to prevent Silverius' return to Italy. In this mission, he failed; but the new Pope, Vigilius, perhaps with information gained from Pelagius, was able to prevent Silverius' from coming to Rome and instead sent him to prison in Thrace, where he soon died. 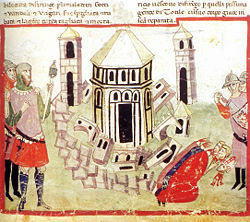 Totila at the siege of Florence: Pelagius I managed the affairs of the Church of Rome as deacon during part of Vigilius' eight-year absence at Constantinople. While Vigilius reigned as pope, Pelagius acquired great influence with Justinian. In that capacity he selected the Patriarch Paul of Alexandria (540) but deposed him and choose a successor two years later. The following year, after having brought about the condemnation of Origen at a local council in Constantinople, he returned to Rome. When Vigilius went, or was forced to go, to Constantinople (November, 545) in obedience to the emperor's orders, Pelagius, holding the office of deacon, remained as his representative in Rome. The times at Rome were hard, for Totila, king of the Goths, initiated a blockade in order to retake the city from the Byzantines. Pelagius reportedly used a substantial amount of his private fortune for the benefit of the famine-stricken people and endeavored to induce the Gothic king to grant a truce. He afterwards induced Totila to spare the lives of the people when he became master of Rome in December 546. However, it should be noted that the Gothic kings had long adopted a policy of cooperation with the popes of Rome and appreciated their independence from Constantinople. Totila was impressed enough with Deacon Pelagius that he sent him to Constantinople in order to arrange a peace with Justinian. However, the emperor sent him back to say that his general, Belisarius, was in command in Italy, and that he would decide all questions of peace or war. Once more the energetic deacon returned to Constantinople, this time to support Vigilius, who was being held against his will and shamefully treated by the emperor in an attempt to make the pope do his will in the matter of the Three Chapters. The issue involved the condemnation of three allegedly Nestorian writings in an effort to assuage Monophysite opposition to the Council of Chalcedon. Encouraged by Pelagius, Vigilius offered a stout resistance to Justinian (551) and issued his first Constitutum (May, 553). But in June—after the end of the Second Ecumenical Council of Constantinople, which condemned the Three Chapters—Pelagius and other supporters of the pope were imprisoned, and the unfortunate Vigilius gave way. In his second "Constitutum" (Feb., 554) Vigilius confirmed the decrees of the Council, including the condemnation of the Three Chapters. Pelagius himself did not submit at once. He wrote against the imperial policy toward the Three Chapters and openly blamed Vigilius for subservience to the emperor in his Defensione trium capitulorum (“In Defense of the Three Chapters”). For this, Vigilius excommunicated him. Eventually, however, Pelagius rallied to the pope's side, or perhaps the emperor's. His supporters held that he did so because he saw that opposition to Vigilius was endangering the unity of the church, while his adversaries alleged that he wished to regain Justinian's favor, and thus to succeed Vigilius as pope. It is certain, in any case, that Pelagius did re-enter into the emperor's good graces, shortly before he left Constantinople with the pope, about the beginning of 555. Vigilius died en route to Rome at Syracuse in June, 555, but it was not till the next year that Pelagius was elected his successor, being consecrated April, 16 556. Pope Vigilius: Pelagius I was suspected by some to have been involved in the death of his predecessor, pictured here. Pelagius encountered significant difficulty in finding bishops to consecrate him, for there was great opposition to him on account of his capitulation to the imperial policy regarding the anathematization of the Three Chapters. His enemies even accused him of being responsible for the death of Vigilius during the journey to Rome. To quote the Liber Pontificalis: "The monasteries and the multitude of the wise and the devout withdrew from communion with Pelagius, saying that he had had a part in the death of Pope Vigilius." With a view to lessen the ill-feeling against him, he went to Saint Peter's, and, holding the gospels and "the Cross of Christ" above his head, solemnly averred that he had brought no harm to Vigilius. Then, to assert the purity of his conduct with regard to his accession to the papacy, he proceeded to denounce simony (buying ecclesiastical office). Independent pope or agent of Constantinople? Pelagius' principal recorded activities during his five years' pontificate seem to be aimed at overcoming the opposition, both to himself as pope and to the Second Council of Constantinople, among the western bishops. He also worked to restore the material damage to the church's property in Italy, brought about by the war between the imperial forces and the Goths. Pelagius was apparently able to convince the Romans of his personal value by using his own wealth for the city's advantage in the same generous manner as he had done when Totila's blockade had reduced them to the last extremity. He repaired and refurnished the churches and reorganized their possessions and revenues for the benefit of the poor. However, Pelagius was not so successful in extinguishing the schism which the condemnation of the Three Chapters had excited in the West. In Italy especially, many had become embittered against the East due to the submission, under duress, of both Vigilius and Pelagius to Second Council of Constantinople. Justinian I, whose policy regarding the Second Council of Constantinople Pelagius I supported as pope. Pelagius did all in his power to convince the bishops of northern Italy, where the schism had taken the deepest hold, that he accepted the decrees of the recent at Constantinople should not be taken constituting opposition to canons Council at Chalcedon. For these bishops, however, the anathematization of the Three Chapters constituted the encouragement of Monophysitism. Pelagius insisted that the differences between the two Councils were only on the surface, and the writings in question indeed deserved to be considered as heretical. However, his reasons left his correspondents unconvinced. Pelagius own earlier writings in defense of the Three Chapters stood as eloquent testimony against him. The pope grew impatient, especially when Bishop Paulinus of Aquileia had called a synod there and renounced communion with Rome. In several letters he exhorted the Byzantine general Narses to use his military power to seize Paulinus and thus suppress the schism. Narses, however, did not move against the pope's enemy. It was not until the early seventh century that the schism, caused in Italy by the condemnation of the Three Chapters, was finally healed. Pelagius was more successful in Gaul than in Italy. Schism threatened there too, but here Pelagius' diplomatic skills were put to effective use. In reply to a request from the Frankish King Childebert, he sent him a profession of faith and expressed his hopes that no untruths about himself might cause a schism in Gaul. The same king then requested that Pelagius appoint a certain Sapaudus as Bishop of Arles, a see whose bishop traditionally acted as the pope's vicar over all the churches of Gaul. Pelagius agreed to this, and with the support of these key figures actions this territory was brought to accept the Pelagius' papacy and the legitimacy of the Second Council of Constantinople. Making use of a decree issued by Justinian in August 554 granting the pope increased authority in Italy, Pelagius organized ecclesiastical tribunals, suppressed abuses among clerics, put the finances of the Church on a new footing, and gathered money and clothes for the poor from Gaul and from "distant islands and countries." Before he died his regulations for the management of the ecclesiastical estates had begun to bear fruit, revenues began to come in to him from various quarters. Known as the "Father of the poor and of his country" Pelagius I was buried in front of the sacristy in Saint Peter's the day after his death. In cooperation with Byzantine policy, Pelagius I organized the temporal government of Rome under direct papal control. In so doing he expanded the papacy’s political power and laid the foundation for a long tradition of papal sovereignty in Rome and its environs. Traditionally, Pelagius is also credited with the building of the Basilica of the Santi Apostoli in Rome, which he ordered to celebrate the complete victory of General Narses over the Ostrogoths. Due to the requirement of imperial confirmation of a papal election during this period of the papacy, five years elapsed between the death of Pelagius and the consecration of his successor, Pope John III. Very little is known of John's pontificate, for it fell during the stormy times of the Lombard invasion, and practically all the records of his reign have been destroyed. During this time it appears the papacy remained caught between the rock of the barbarians on the one hand and the hard place of Byzantine ceasaropapism on the other. The Three Chapters schism, which came about in northern Italy during Pelagius I's reign, would not be healed until the beginning of the next century. History of "Pope Pelagius I"
This page was last modified on 10 April 2015, at 16:16.